Playing with food is a good thing! A colourful garden of fun fruits, veggies and more, Skip Hop’s Farmstand Grow & Play Activity Gym stimulates baby’s senses and continues to teach as they grow. Packed with lots of engaging textures and sounds for baby to explore, the soft play mat features cheerful farm graphics and numbers. 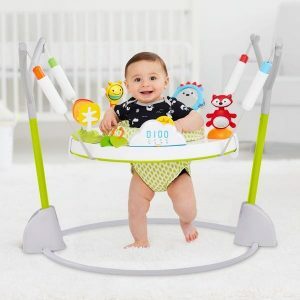 Fold-up sides create an enclosed play space that’s perfect for tummy time play. A bright watermelon wedge pillow with plush texture, and a cute side pocket let baby “pick” their own veggie. Five hanging toys include an avocado rattle, a beet squeaker and a musical bunny to keep baby busy and happy. 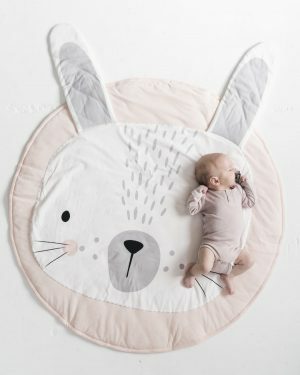 When little ones sprout up, the removable arches convert to a growth chart.